Working-class bungalows along Jarboe Street, seen in these 1940 photos, were home to salesmen, office managers, a water department employee, a car mechanic and others. The West Plaza neighborhood is one of Midtown’s historic areas where working-class families owned and rented homes in these photos. This block of Belleview and Jarboe between 45th and 46th is a great example. Residents in these 1940s photos included streetcar and meat packing workers, a movie theater projectionist, and the owner of a watch repair business. A search of newspaper articles from the 20th century reveals little about the block. Many families rented these small homes for a few years and then moved on. One family that stayed at least a decade was Otto Mueller, a water department draftsman, and his wife Enid. Records show the Meullers living at 4511 Jarboe from at least 1931 until 1944, the year Otto was found dead in the basement, where he had gone to fire up the furnace. Among their neighbors in the 1930s were Walter Bennett and his wife. Bennett was a milk delivery man and his wife often rode along with him on his morning route. As part of our Uncovering History Project, the Midtown KC Post is taking a look at each block in Midtown, including a set of 1940 tax assessment photos which is available for many blocks. (Many people seem confused by the tax assessment photos, which all include a man holding a sign. Here’s the story behind them). Today, photos of the block between Jarboe and Belleview from 45th to 46th Streets. Jarboe homes and apartments in 1940. 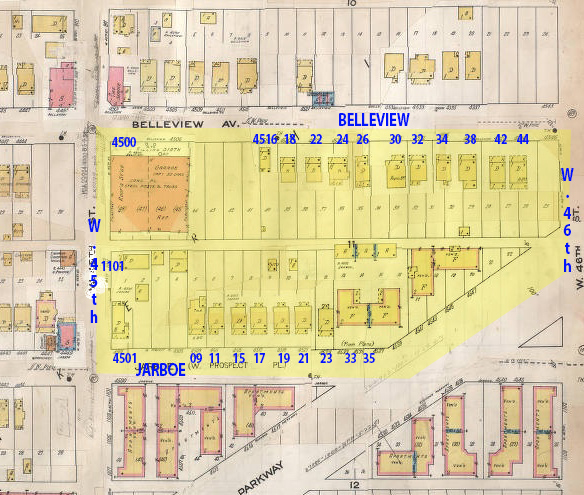 The 1940 census of the block offers a glimpse into the families who lived on the block that year. 4516 Belleview: Swedish immigrant and street railway flagman Fred Broden owned this home with his wife Alma and son. 4520 Belleview: Taxicab driver Leon Knoderer rented here with his with Ruth Naomi. 4522 Belleview: Guy Best, who did office building maintenance, rented here with his wife Lela and a son. 4524 Belleview: Watch repair company owner Kenneth McIntire owned this home with his wife Beatrice, two sons and two daughters. 4526 Belleview: Automobile salesman William Gregory owned this home, shared with his wife Edna, two daughters and two sons. 4530 Belleview: Grocery shipping clerk Andrew Wetherill and his wife Edna rented here. 4532 Belleview: German immigrant Catherine Viskocil was listed as owning this home, where she lived with her daughter. The family of Frank Taber. A laundry industry collector, also lived here, including his son. 4534 Belleview: Cab driver Clyde A. King rented this home with his wife Forrest and two sons. 4538 Belleview: Meat packing company calf skinner Ernest Floyd and his wife, Emma, who was the president of VFW auxiliary, rented this home. 4542 Belleview: Retail grocery salesman Melvin Riffe and his wife Kathleen rented here. The home may have been owned by Irish immigrant Mary Deighan, who shared space with two nephews. 4544 Belleview: Roofer James McKittrick owned this home where he lived with his wife Myrtle. 4533-39 Jarboe: Nine families lived in this apartment, including an electrical engineer, several office managers, and a doctor. 4523 Jarboe: Department store maintenance operator Axel Haglund owned this home with his wife Minnie and two sons. 4521 Jarboe: Bank auditor Joseph Jackson owned this home with his wife Anne. 4519 Jarboe: Metal factory owner Paul Oliver Rogers owned this home. 4517 Jarboe: Motion picture projectionist James Smith owned this home with his wife Agnes. 4515 Jarboe: Automobile mechanic Edgar Walquist owned this home with his wife Elizabeth. 4511 Jarboe: City water department draftsman Otto Mueller owned this home with his wife Enid. 4509 Jarboe: Machinist Stephen Pavola rented here with his wife Ursala. 4501 Jarboe: Meat factory sausage stuffer Edward Ashley owned this home with his wife Ona, two sons and his mother-in-law. At the same address, the family of building repairman Adam Young rented with his wife Anna, three sons and a daughter.